We've got a pulse on how electronics are held together. Armed with the data from hundreds of teardowns and thousands of repair guides, our teardown technicians were able to curate the most capable compact toolkit. The new Pro Tech Toolkit is the one thing every DIYer, fixer, hacker, hobbyist, and professional needs to tackle any job. It's all-new and it's all-powerful. Every tool in the Pro Tech Toolkit has been re-engineered to be better. 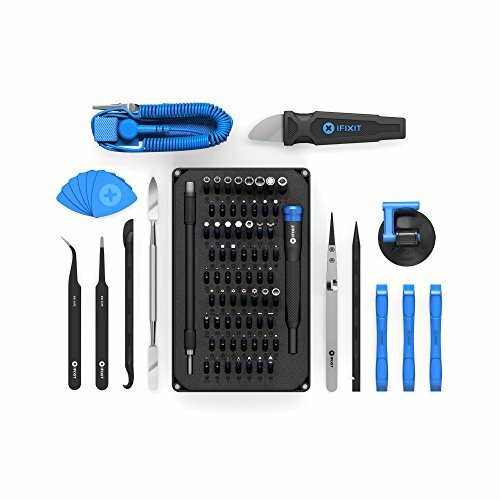 From the 64 Bit Driver Kit to the iFixit Opening Picks, every tool is specially designed and selected to maximize your repair capabilities. At the core of this kit is the iFixit 64 Bit Driver Kit, designed with extensive research into what fastener types are currently used in the consumer electronics industry and which legacy fasteners are still in demand by consumers. From the Apple Watch with its new tiny Tri-Point screws to vintage Nintendo game consoles with gamebit fasteners, the 64 bit kit covers them all with the highest quality CNC machined bits. Even the sturdy case was carefully engineered, having no hinges or latches to break, and features a sorting tray inside the magnetically attached lid. All tools designed and manufactured by iFixit using the highest quality materials and methods. Includes the 64 Bit Driver Kit, the highest quality most comprehensive CNC machined bit set. Covered by iFixit's Lifetime Warranty. If you have any questions about this product by iFixit, contact us by completing and submitting the form below. If you are looking for a specif part number, please include it with your message.